We had a great time, we received a wonderful welcome with a Greek Drink from Joan . He and Anna are very friendly couple. It was nice to talk with them and spend time together. The room was nice and very comfortable. We enjoyed the visit and before we left we received coffee and cake to celebrate the good life and friendship. Thanks for everything and for the hospitality. The room was very clean! The bed was big and comfortable and the hostess was very kind! Just had the most fabulous holiday at Pension Anna. Amoudara is a lovely town with great places to eat, a good bus service and a fantastic beach on the door step. Anna made myself and my husband very welcome and we could not have asked for more hospitality from Anna and her husband. Our room was regularly cleaned and the bed was very comfortable. We were very sorry to leave to come home and will hopefully return to Anna's in the near future. The host was so very nice. She was the best part of pension Anna. Pension Anna is a recently fully renovated and refurbished pension with impeccably clean and well designed rooms/studios with a balcony. Everything in the best Greek tradition of hospitality, cleanliness and service. The owners are very, very friendly and accommodating. On top of all that is also its location, a stone’s throw from the beach and within easy walking distance from restaurants and shops. The pension itself is in a very quiet location, with ample parking space. A very welcoming and comfortable place to spend one’s holidays and excellent value for money. Very hospitality! Guests are the number one during the stay. Everyting is possible. Rooms are really clean. Location is perfect, especially during summer. I would say, ta leme. I will come back! Everything inside are new. The owners are so kind and sweet People. Lock in a great price for Pension Anna – rated 9.5 by recent guests! One of our best sellers in Amoudara Herakliou! The family-run Pension Anna is located in Ammoudara Village of Heraklion, just 250 feet from the sandy beach and within a short walk from restaurants and shops. 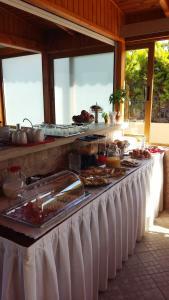 It offers self-catering accommodations with free Wi-Fi and a private balcony. Heraklion City and Port are 4.3 mi away from Pension Anna, while Nikos Kazantzakis International Airport is at 6.8 mi. The famous archaeological site of Knossos is at 6.2 mi, while Archanes Town is 14 mi away. Free private parking can be found on site. When would you like to stay at Pension Anna? Featuring a kitchenette with fridge and cooking hobs, this studio is just 230 feet from the beach. A private balcony and free Wi-Fi access are available. Some units enjoy views over the Cretan Sea. Consisting of a separate bedroom and a bedroom with kitchenette, this apartment is just 230 feet from the beach. A private balcony, a fridge and cooking hobs are available. Guests enjoy free Wi-Fi access. Overlooking the Cretan Sea from its private balcony, this apartment consists of a separate bedroom and a bedroom with kitchenette. A fridge, cooking hobs and free Wi-Fi are available. This apartment features a kitchenette, flat-screen TV and kitchenware. House Rules Pension Anna takes special requests – add in the next step! Other Cash Pension Anna accepts these cards and reserves the right to temporarily hold an amount prior to arrival. Pension Anna accepts these cards and reserves the right to temporarily hold an amount prior to arrival. Please note that the property consists of 3 floors and has no elevator. Great location and really nice rooms. The owners were very friendly and helpful! It’s was perfect, good relations and service! The property was a wonderful surprise! The owners Anna and John were incredibly hospitable and helpful the place was very clean and hommy and felt very safe. Deffinetly will recommend it to family and friends hopefully we will get the opportunity to visit again! Anna and her husband went the extra mile to make us confortable and feeling at home. 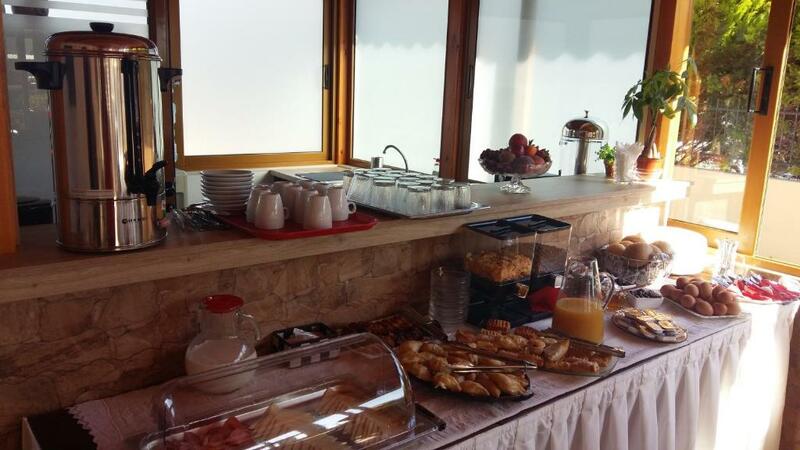 The property is really close to the beach (3 /4 minutes walking) and the breakfast was excellent for the price. I highly recomend Pension Anna. The owners are very kind and friendly. The rooms are clean and nice. The Pension Anna it is in a good location, in a quiet area, very close to the beach and to the bus station to Heraklion and Airport. There are public transport, direct buses no. 1 and no, 6 to Airport and downtown. There are many free parking place, even if you don't have reservation. Good traditional restaurants (taverna) in the neighborhood, a lot of souvenir shops and mini market shops. The breakfast room smelt of people smoking. Nothing to dislike, all good. Modern room, quiet, very spacious top floor apartment with good balcony view to the hills and ocean. Kept very clean, aircon was excellent. Owners Anna and Yannis are very friendly and always onsite to help. Two minutes walk to the beach and its many bars/cafes. Walk 150m the other way to the main road and the centre of town with everything you need right there. Great location, great rooms, sparkling clean, 5 steps from the beach. Mrs Anna is a very warm and well hearted lady that welcomed us and made our stay really comfortable. She prepares the breakfast herself and brings it to your table. It was really nice experience! PS the pension has a reception. Mrs Anna and her husband are always around there to greet you and welcome you. Thank you very much for everything! There are much better beaches in Crete. Friendly hosts, large room. Convenient location for exploring Heraklion and surroundings. Much better from the inside than what you would expect by seeing the surrounding buildings. Quiet room.